The Wall Street Journal reports that stocks' momentum keeps building. At 3:30 p.m., the Dow Jones Industrial Average rose about 141 points to 7890, led by strong gains for tech stocks such as Intel, up 6%, and Hewlett-Packard, which rose about 7% in recent trading. Both companies drew buyers after Best Buy posted a better-than-expected full-year outlook, showing that there are still buyers for technology products. Best Buy, which isn't a Dow stock, rose 12%. The Nasdaq Composite Index rose 2.8%. It briefly pushed into positive territory for the year earlier in the day but has since eased amid a broader easing of buying. The S&P; 500 climbed 1.4%, led by gains in its tech, basic-materials and industrial sectors. Stocks were helped, in part, by an auction of 7-year Treasury debt, which rekindled investors' previously flagging confidence in the U.S. government's ability to finance its efforts to rescue the economy. "This is a good sign that quantitative easing is working so far [Although the economy is rapidly worsening, the fed's quantitative easing is expanding the monetary base even faster. ]," said Art Hogan, chief market analyst at Jefferies & Co., alluding to the Federal Reserve's plan to buy long-term debt to further boost the economy. He said that effort seemed to help demand in Thursday's auction. Also spurring an extension of nearly three weeks of gains for the stock market was a push from institutional investors to buy stocks most likely to benefit from an economic recovery. "We know there's no magic bullet, but there is a lot of faith in what the government is doing here [I too have "faith" that the fed will push up stocks by destroying the dollar]," said Robert Weinstein, senior managing director for Lighthouse Financial Group. "Some of those hedge and other funds that went into cash at the end of last year are just starting to get back in now [The velocity of money is accelerating! For more on the velocity of money, see how deflation creates hyperinflation]." Todd Leone, head of listed trading at Cowen & Co. in New York, said that the widely held belief on Wall Street that the market's rally is a bear-market bounce [The market's rally isn't a bear-market bounce. To believe stocks will be making new lows this year, you have to believe the dollar will maintain its value. That is a losing bet.] could, somewhat counterintuitively, provide fuel for it to continue longer than expected as new buyers gradually come off the sidelines. "A lot of people don't believe in this rally [The rally is being driven by the dollar's devaluation which makes it very real]," he said. "But it's been acting well, with a lot of momentum." Wall Street is starting to look ahead to the coming earnings season, which is due to kick off on April 7 when aluminum maker Alcoa announces its results. "We know the [market's] earnings are not going to be good," said Mr. Hogan. "The main hope is that they're better than the fourth quarter and that the market has done an adequate job of pricing in the expectations. That will be the major test of the rally that we've seen." According to the research firm Thomson Reuters, which tracks Wall Street's earnings expectations, analysts expect earnings at S&P; 500 companies to show a 36% decline for the first quarter, compared to a 67% slide in the fourth quarter of 2008, when crisis erupted on Wall Street. News on the economy is far from upbeat [because the US economy is disintegrating]. On Thursday, the Labor Department said initial claims for state unemployment benefits climbed 8,000 to 652,000 last week and total claims rose to a record high over 5.5 million, suggesting that job losses are continuing at a rapid clip. Separately, the government issued its final reading of fourth-quarter economic activity. U.S. gross domestic product shrank at a revised 6.3% annual rate in the October-December period [Ugly], a bit faster than the 6.2% rate in the last reading. The reports ran counter to the more optimistic tone in recent readings on home sales and durable-goods orders [the "good news" about home sales and durable-goods orders was created by the dollar's devaluation]. But some traders and analysts think the market is in a bear-market rally that could last at least through the upcoming earnings season, when red ink and glum forecasts by companies may spoil the party. One sector well outperforming the broader market was solar companies, which soared following a media report from Asian technology newspaper DigiTimes that the Chinese government is open to supporting the local development of solar energy in China. Companies such as Suntech Power, Yingli Green and LDK Solar all jumped more than 30% on the report. My reaction: The current stock rally is being driven by dollar's devaluation, which makes it very real. 1) The stock market has experienced nearly three weeks of gains, with the Nasdaq briefly pushing into positive territory for the year. 2) Weak demand for Wednesday's auction of five-year treasuy notes rattled investors. A) Job losses are continuing at a rapid clip, with claims for unemployment benefits rising to a record high of over 5.5 million. B) US GDP shrank at 6.3% annual rate in the fourth quarter of 2008. 4) Investors are misinterpreting the stock rally and "positive" readings on home sales and durable-goods orders as signs of economic recovery, when they are signs of a dollar collapse. "This is a good sign that quantitative easing is working so far,"
"We know there's no magic bullet, but there is a lot of faith in what the government is doing here." "Some of those hedge and other funds that went into cash at the end of last year are just starting to get back in now." 6) The DOW has probably seen its low in terms of dollars. 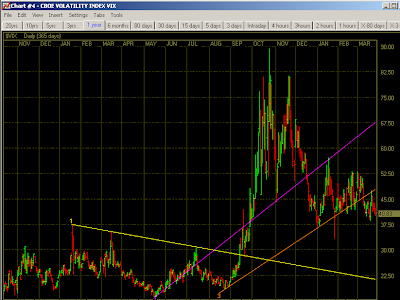 7) Looking at the one year chart shows that the VIX has begun to break down. The VIX (Chicago Board Options Exchange Volatility Index ) measures is the the implied volatility of S&P; 500 index options and is a good proxy for investor fear in the market. 8) Looking at the eighty day chart of USO (United States Oil) shows how the dollar's devaluation is causing energy prices to rally. 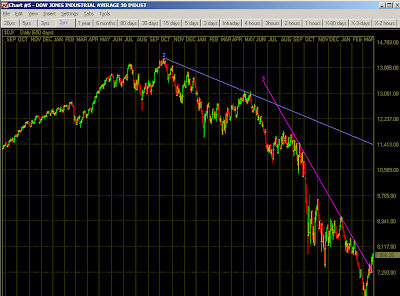 9) The chart of the US $ INDEX shows how the dollar is bouncing off its rising trend line. 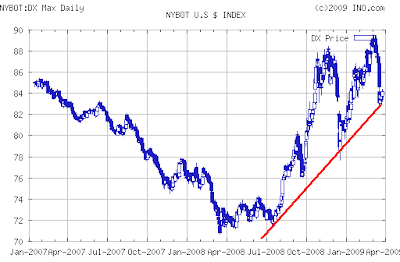 When this trend line breaks down, the dollar will soon begin making new lows. Conclusion: With the accelerating velocity of money, all the fed's current and past money creation is beginning to reach the market. With the dollar's devaluation driving up prices, stocks will rally even as the economy implodes. 1) The market isn't experiencing a bear-market bounce. Stocks will continue to rise in relations to devaluing dollars, while their real worth, as measured in gold, will fall. 2) Weak demand for five-year notes on Wednesday is a warning sign that the US, like Britain, is losing its ability to finance its spending (without printing cash). Expect failed treasury auctions within the month. 3) DO NOT SHORT THE MARKET. With the fed planning a 15-fold increase in us monetary base, being short the market is extremely dangerous. Do not be fooled by the appearance of economic recovery created by the dollar's fall! The onset of hyperinflation is often misinterpreted as economic recovery. If you haven't already, I read about The Nightmare German Inflation. In offers grim preview of what awaits the UK and US. It also illustrates the imaginary wealth created by a currency collapse. The mechanism of inflation was simple. The government issued paper promises to pay, and the Reichsbank issued money on the security of these promises. [US sells treasury bonds. The fed then buys these treasury bonds with printed cash. Simple no? Today this process is called quantitative easing.] When a government spends more than its income, it must borrow. If it merely borrows money from its citizens by selling them bonds, there need be no inflation. Instead of that money being spent or invested by the citizen, it is borrowed and spent by the government, but the total amount of money is not increased. Hyperinflation is by far the most devastating economic disaster a country can experience. While deflation, like the US experienced in the 1930, brings suffering, hyperinflation wipes out the middle class and destroys the very fabric of a nation's society. In trying to "protect" America from deflation, the fed is steering the country towards a far worse fate. This entry was posted in Background_Info, Currency_Collapse, Market_Skepticism, Wall_Street_Meltdown. Bookmark the permalink. How long will this inflation-induced stock market rally last? Up until the dollar collapses? Gold has been manipulated and not been a reliable indicator of inflation for the last 30 years.If the manipulation continues are there other accurate indicators? It seems that this could be complicated as the price of something is always relative.I need a constant.Any ideas? Great post. The pity of the situation is that it could be avoided if the Fed would allow interest rates to rise and if the government would stop the idiotic "stimulative" deficit spending. It almost seems as if they are trying to create hyperinflation. If a person does not trust the stock market, how can he protect his savings? see a rapid increase of trade. Eric...have you seen this on the coming foreclosures? We'll be making news lows in the stock market sooner than you think. Certainly by the end of the year. A sinking dollar, which is far from guaranteed at this point, especially given the desperate state of other fiat regimes, will not save stock indexes which are full of companies that are bankrupt or soon to be. thanks eric. Not many are willing to present a side of the truth as you have done. Most keep it hidden, or deny it, including many of the so-called "stock" blogs out there. printed money stock rallies, how long they last depends on what part of the biz cycle you are in. and in this portion of the biz cycle, they dun last long. perhaps one should go back and review periods of history with that in mind and see the results. I can see why quantitative easing should lead to inflation in theory, but absent rising prices in general, how do we know that the rise of the stock market is a sign of inflation (i.e. 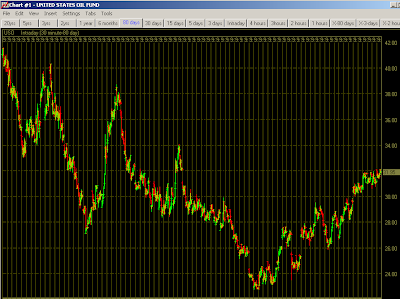 dollar devaluation)? Is there evidence that the rise in stock price is driven by the introduction of new money into the system? Has there been time for this money to work its way into the system? The previous meme intended to talk up the market was the US enter and hence will come out of the recession first. Now the meme is that inflating money supply in a contraction phase will cause a stock market rally. I had my doubts about this blog and now this seems to confirm it as a deep cover manipulation tool. What can't be covered up, it then simply states the obvious to those who have eyes to see to gain credibility. The Fed, etc, etc will off course try to do an Alamo. But how long can the ammo last? And soon the cannons will be ready to fire. Anonymous - if this really is a "deep cover manipulation tool", doesn't that mean we should read it all the more assiduously, if only from a contrarian perspective? The problem today with manipulation is, that there are all fashion on true or manipulated articles out there.. on every topic and in every aspect. I do not believe anything that is said in the "big press".. and very less of what I read here. The problem with the "news analysis" here, is that it doesn't really drill down to the cause and effect and/or seeks out to find news evidence supporting a clear - previously taken - argument. - The world is overborrowed, lenders can't anymore shoulder the debt burden (the game was anyway rigged from the start). - Without expanding debt, lending institutions have to fail. Someone new always has to go to debt (that are the game rules). Because no one does it, goverments do it or invent new money. - Due to the debt/interest burden, all the money or assets get channeled to the lenders. At one point there is no more to channel upwards as the burden gets to high. - Because private "banks" can create money "out of thin air" by issuing loans, the whole game is rigged from the start. - As a side note: The whole stock and PM market is essentially also rigged to support the whole bubble or make cash for the people which can rig the game. - There is no sure way, because we do not control the game. What can one (or a cautious investor) do if he expects that the system breaks apart within the next 10 years (in my opinion)? - Invest in property that guarantees a sustainable and low-energy consuming lifestyle (even saves today), but only if you are sure that you can stay where you are. - Invest in everything that really provides a substantial benefit for your life and/or is long wearing (e.g. education, health, mechanical tools, clothes, bikes, goods that are essential for life and which you are need anyway). - Invest a small amount in playing the usual game in case the current system unexpectedly carries on. The M1 Money Multiplier put out by the FED says the velocity of money is not increasing. If you give me a million dollars and I stick it under the matress, has the velocity of money changed? No, and that's exactly the problem! No matter how much money the Fed dumps into the economy, it will be stuffed away and do nothing. For now. As soon as people start to realise the dollar is extremely overvalued they will dump their dollars. If enough people do so they will create inflation and spread fear, this will start a chain-reaction of people selling the dollars the Fed created some time before. In the end everybody will spend dollars as fast as they can, welcome to hyperinflation. I'm sorry but I'm with the deflationists on this one and I'm baffled by the stock market rally even in terms of dollars. I expect that this rally will not last and that this is not the bottom as Eric says for the stock market in terms of value in the dollar. I'm going to do more research and find out what this rally is about, it makes no sense to me. The stock market shouldn't be rallying(even in terms of dollars) when their is a credit contraction that is getting worse. Although this is what happened in Weimer, it makes no sense to me, as I am also baffled by the stock market rally that happened in Weimer. A credit contraction would be preventing money from moving through the system, although that wouldn't stop prices of things from rising, i can't understand prices of stock rising. Based on the french revolution in 1790, you'll see that the stock market will rally because the inflation is masked by the apparent increase in business activity. The increase in activity lets companies report increasing sales and it appears that business is picking up and recovering. So it looks like people are doing business buying and selling. However, the reality is that prices are rising and people realize they need to buy stuff to protect themselves against the inflation...and they start buying everything and anything. It is important to remember that after the french revolution of 1790, their fiat currency appreciated and depreciated over the course of 5 years. Their currency did have value during the hyperinflation. It wasn't until the very end that their currency was completely worthless. "[Although the economy is rapidly worsening, the fed�s quantitative easing is expanding the monetary base even faster. ],"
If you're suggesting that the base money is increasing faster than credit is contracting I have to disagree. Also Base Money can not move as fast as credit which is why we are in the problem we are in today. It's like Credit is the wide reciever and Base Money is the quarterback and they are both practicing passing(Fractional Reserve Banking). Only with every pass credit, goes longer causing base money to have to throw farther. But base money's strength is capped($100 bills) at a level for him to only be able to throw so far. So what happens is the passes Base Money trys to make become too short, not reacing credit. The coach(the govt.) wants Base Money to be able to make those far passes so he tells Base Money to get in the gym and pump up the strength in his arms. Base Money tries to get stronger but it takes time and work and as this is going on Base Money is losing games. Coach is impatient so instead of getting stronger the healthy way through practice and hard work(production and savings) the coach advises Base Money to take steroids(print larger bills). The league(the rest of the world holding US dollars) quickly gets wind that Base Money has been taking steroids as it is obvious by Base Money's larger muscles(larger bills) and disqualifies him from the game(dumps the dollar). But the fact is Base Money lost before he took the steroids as he never achieved a way to make those long passes(credit crunch) and would have continued to loose games causing him(the US dollar) to not make the playoffs and to be the loser in the league. And in this game the only team that makes it to next season is the champion (which will be gold/silver). This champion will be playing against new teams next season. Gold/Silver's strategy will not be passing(Fractional Reserve Banking) but running(Full Reserve Banking). "[The market's rally isn�t a bear-market bounce. To believe stocks will be making new lows this year, you have to believe the dollar will maintain its value. That is a losing bet.] "
I don't agree that stocks and the dollar move in opposite directions. The cause of the devaluation of the dollar has already happened, we just haven't experienced the effects yet(which is rising prices). All this printing is just a way to make the system die slow as apposed to quickly with defaults. But the system will die eventually. I'd say the system has no more than a year left in it to postpone massive defaults(death). Actually Full Reserve Banking is an oxymoron. If you let someone hold your money with the expectation of getting it back on demand, you've just created credit as that money is in the possession of two people(you and the person you let hold it) so in actuality there is no difference between Full Reserve Banking and Fractional Reserve Banking. Anyway the only banking people will be practicing with gold/silver is hoarding their money themselves. And this is a winning strategy. My guest why the stock rally? There is so much money out there... the ones who manage it or have it have to do something with it. So what to buy with soon worthless electronic paper slips? You can always pay taxes in dollars! Stocks rallied because this Quantitative Easing gave the market a little confidence. But it's a knee jerk reaction and soon this rally will end(we've probably just witnessed the end this Friday). Going back to my football analogy I should add with every game lost because Base Money couldn't complete the passes to credit, Base Money looses confidence and his lack of confidence makes his arm weaker(with every default and loss in the stock market people run out of the stock market and withdraw their money, leaving less money in the system at a time when more money is needed). This stock market rally was based on 2 things 1 Quantitative Easing and 2. Confidence that Quantitative Easing will stop the credit contraction but the forces of credit contraction are far greater than those of confidence and Quantitative Easing(with $100 bills) and the credit contraction will continue. This confidence slowed that outflow of cash from the system and that coupled with the massive printing(Quantitative Easing) is the reason stocks rallied but the credit contraction is so great that even if all confidence was restored and we continued with Quantitative Easing(with a $100 bill cap) the credit contraction would continue. Which is why this rally will not last. Confidence is really a small factor here. Like I said before, to say that credit is contracting or the dollar looses value because people have lost confidence in the market or the dollar is suggesting that people are not willing to trade hundreds of trillions of dollars worth of their wealth when the truth is there is not that much wealth in the world. The World much less China alone can't buy up the amount of Treasuries we need to sell to stop this credit contraction because there is not that much wealth in the world. This credit contraction and stock market decline will continue even in terms of dollars and even while dollars are declining in value(prices of things are rising). Don't fall for this rally stick to reality. , this rally is like the quarterback being able to throw a little further but still coming up short. The fans=the media cheering this attempt even though the pass was incomplete(economy worsens with more poor earnings reports and increasing job losses) and credit shows all the signs of going longer out of reach of Base Money's passes. Right now the govt. needs a prayer(a Hail Mary in my football analogy) but the quarterback(base money) has no arm. i meant to remove that last paragraph, ignore it. [the �good news� about home sales and durable-goods orders was created by the dollar�s devaluation]. What a load of garbage. The durable-goods orders are from before the Fed announced QE. The dollar has retraced most of the depreciation caused by the announcement of QE. i can't understand prices of stock rising. Read Murray N. Rothbard - What Has Government Done to Our Money. You can download it free from mises.org. other groups in acquiring the new money. Because banks got money first, they loaded money in NYSE and other markets. Yeah but banks are insolvent. The money they get from Quantitative Easing goes to pay down debt. That money can't get out of the banks. Like I said the reason stocks rallied is because of word that the Fed will use Quantitative Easing, the word gave false confidence to sideline investors that this Quantitative Easing will stop the credit contraction. So Investors put money in the market, this prompted some others to follow as they saw stocks rising, thinking the Fed's plan was working but like I said the Credit Contraction is far greater than the Fed's Quantitative Easing(with a $100 bill cap) and there's only so much money on the sidelines. This money on the sidelines is minuscule compared to the amount of money contracting/evaporating. Those who caused this rally will loose their money as the credit contraction continues and the market tests new lows on it's way to crash. Time is coming when the only way to slow this credit contraction is Zimbabwe size denominated Federal Reserve Notes. Question: With all the money Washington is throw� ing around to fix the economy, how is it ever going to be able to repay it all? Answer: The government has no intention of paying down all of its debt. Frankly, it would be impossible to do so, and maybe even not so desira�ble. That doesn't stop people from railing about it, though, does it? As of March 23, the total amount of public debt outstand�ing was $11.04 trillion. Of this, the "public" held $6.75 trillion, and total "intragovernmental" holdings equaled $4.30 trillion. All told, the public debt has been growing at roughly a 17 percent clip over the last 12 months. No one thinks it will slow down any time soon. By most estimates, Washing�ton is going to run at least a $1.75 trillion deficit in fiscal year 2009. If you assume a population of 300 million, this works out to be roughly $23,333 per family of four. Not so long ago, this amount was a decent down pay�ment on a reasonable house. So what about $11 trillion? Well, how does $36,000 per per�son strike you? How about $144,667 per family of four? So, no, the government has no in�tention of paying down this debt any time soon, because it doesn't have the ability to do so. What about President Oba�ma's pledge to reduce the deficit in half in four years? This year's deficit is $1.75 trillion, meaning the president is apparently promising an $875 billion budget shortfall by the end of his term. By that point, Washington's ag�gregate indebtedness will have grown another $3 trillion to $5 trillion, but who is counting? As such, your individual share of the national debt will probably be somewhere between $45,000 and $50,000. Essentially, the national debt and the budget deficit are two re�lated but very different things. Halving a $1.75 trillion yearly budget deficit is nowhere near the accomplishment retiring half the nation's debt would be. However, given Washington's current spending habits and am�bitious plans, it would still be a pretty neat trick, if not an awe�some one. As for the current spending spree, global leaders are begin�ning to question the wisdom of our ways. Much has been made of China's recent concern about our country's continued credit worthiness and the health of the U.S. dollar. Further, buried in the news were the European Union's president's words on the matter: "All of these steps, these combinations and perma�nency is the way to hell." That is pretty strong, albeit dicey, talk; however, it remains to be seen whether the rest of the world can resist the siren song of U.S. Treasury debt. After all, we haven't had any problems selling huge amounts of the stuff up until now. Still, the global appetite for government debt might be at a tipping point, in general. Last week, the British government wasn't able to sell all of its debt at a scheduled auction. This is known in the investment indus�try as an auction failure, and they are not all that common in industrialized countries. True, the United Kingdom and the United States are not the same, and British debt isn't as liquid as American debt, and all of that. However, Britain isn't ex�actly a Third World country ei�ther. In the end, the bigger ques�tion for me isn't whether or not the United States will be able to retire all of this debt. It won't, any time soon. The bigger ques�tion for me is whether or not the world's investors will even buy all that we are selling. That is a more immediate concern and potentially a very real problem. John Norris is managing di�rector of wealth management at Oakworth Capital Bank. He may be contacted via e-mail at John.Norris@OakworthCapi�tal.com.